& Join Us On Facebook! A puppy deserves his own treats, just like the big dogs. But, what makes a good puppy treat? First, the texture. Most puppies need a soft treat that they can easily chew. The second consideration is size. Puppy treats need to be small, or at least small compared to your puppies mouth. Thankfully you know how to make your own homemade dog treats. You can customize your puppies treats so she can get the very best straight from your kitchen. Try out one or all of the following treats that are especially good for little puppies. Blueberry & Banana Dog Muffin - Soft and sweet, no not your puppy, these little muffins are the perfect size and texture. Make them extra small by using a 1/2 Tablespoon cookie scooper. 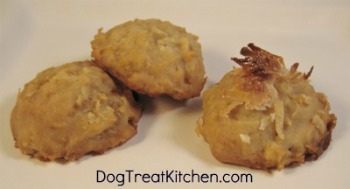 Pina Colada Dog Cookies - Introduce new flavors to your puppy with these very soft and delectable pineapple cookies. You can substitute the brown rice flour and tapioca flour for 1 3/4 cup of whole wheat flour. You can skip the shredded coconut, or find unsweetened shredded coconut at my favorite place, Amazon.com. 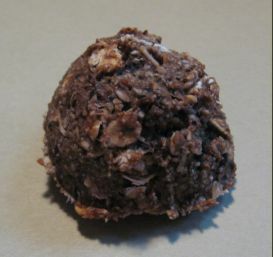 The above treats are just a small sample of all of the soft dog treat recipes you can find on my site. Use the Search function at the very top left above the navigation, type in "soft treat" to find many many more recipes that will fit your puppies taste buds. You can now interact with me on Facebook directly from the website, too. You don't even have to have a Facebook account to post your feedback or questions! Just go to a page, scroll all the way down to the bottom and click on the "Add a comment..." box to get started. Don't miss out on the Puppy Theater where there's several videos of cute puppies, well, just being cute puppies! There is also a list of 50 wonderful things you can do to celebrate this glorious Puppy Day. #38 is especially dear to my heart - Pledge to feed your puppy only all natural food and treats. But don't stop at puppies, all dogs young and old, will benefit from a little extra love, attention and care. You have many choices of dog treat recipe books. People are beginning to see what you've known all along, homemade is fresh and includes quality ingredients. So, what makes the recipes I've developed in my eBook different? Easy - I made sure to make each recipe have 5 ingredients, or less. That's a tall order for a delicious and healthy dog treat. Each recipe also has common ingredients and simple equipment so you can get started making treats right away. 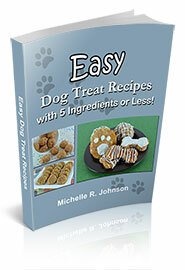 Check out my eBook 15 Easy Dog Treat Recipes with 5 Ingredients or Less! and if you have questions, contact me on Facebook and I would be happy to help you in any way I can. Or, join the hundreds of people who have already started making their own easy, healthy and delicious dog treats by buying my recipe eBook today. "Just want to say I LOVE your site, all your help. You are an amazing dog lover and my little JRT loves everything I make. Then I started making treats for the 2 rescued dogs my daughter has now and they love when I visit because I'm never empty handed. Then others asked and now I am supplying a number of rescued, elderly, and other pets that just need to start eating more healthy."